NOP is short for no operation and indicates that no escrow system should be used and thus consists of a direct payment from the buyer to the seller. MAD is short for mutually assured destruction escrow, both buyer and seller deposit a certain amount of cryptocurrency as &apos;insurance&apos;. The insurance deposit deters malicious scammers from posting listings, without the intent of actually delivering the item or service they advertise. The ratio is the insurance deposit amount, expresses as the percentage of the amount being transferred (the base_price including additional shippings costs etc). In game theory, the Nash equilibrium is a solution concept of a non-cooperative game involving two or more players in which each player is assumed to know the equilibrium strategies of the other players, and no player has anything to gain by changing only his own strategy. Below you can find the payoff matrix for the MAD escrow system. 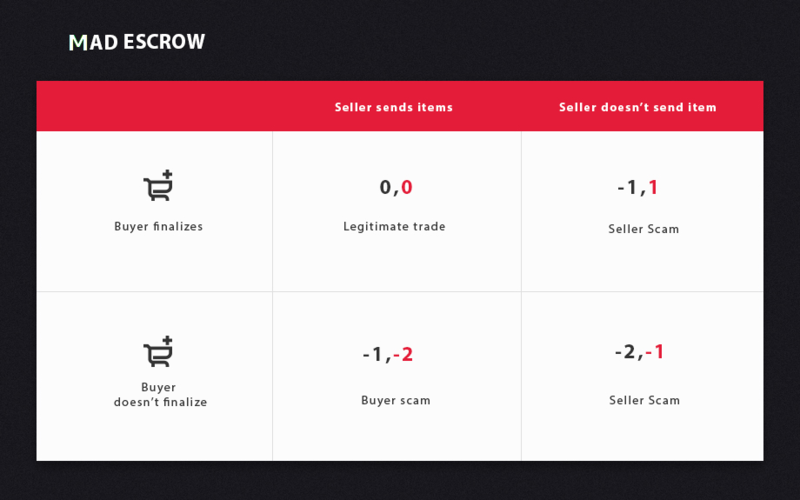 There exists a Nash equilibrium for both buyer and seller (with ratio = 100% of the purchase price for both) if buyers are dedicated to punishing malicious scammers. If the buyer and seller are unable to agree on the same strategy then all funds become unspendable after X amount blocks. Special scenario: This is a "normal" multisig, the buyer deposits the payment but there are no insurance deposits.